The CHAOS operator will provide a new source of uncertainty to the teletype via chaotic, yet deterministic systems. 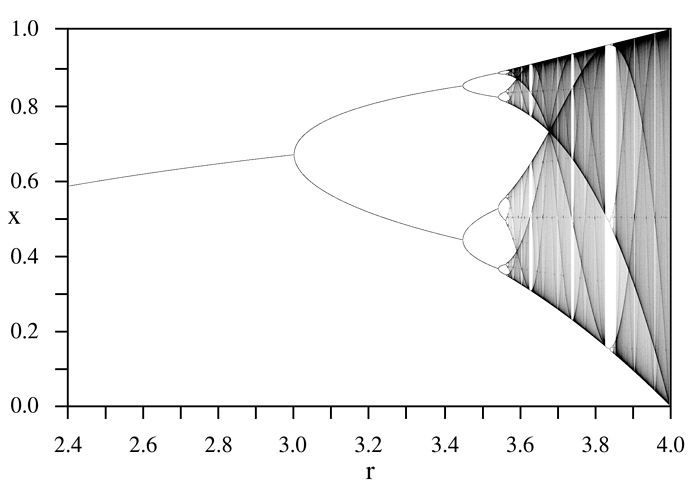 Here is a progression of the Logistic Map, which devolves into chaos past certain parameter values. I haven’t put my nose to the grindstone on this operator, so before I start, I’ll put the usual design questions in play. And, if anyone wants to suggest algorithms to implement, I’m happy to hear them. Some links were shared in the other thread, but I should be able to implement anything that relies on only arithmetic and sin() and cos(). I’m interested in knowing what an algorithm is useful for, more than anything. While we don’t have to stick to only one algorithm, we should probably limit the set to a small, useful set. Given the difference in parameter and value type, this algorithm should be spun off into a new operator. How do you all use random, chance, and accident? What will it do? Can you give an example? That would help. Top post updated with brief introduction. I thought $ was great for CHAO$! Amazing! I love it to bits, as SCRIPT is so useful but so long. Still not following. Can you give a code example? Does it take parameters? Does it return a value? Got it! Thanks. I can’t help with the math, but I will enjoy reading responses! What if you do a namespace that means “function”? That way you can create chaos functions, but also more mundane stuff like a simple exponential curve? Not in love with ! but I think the concept of multiple functions could be interesting. Are different implementations of CHAOS worth pursuing? Then have multiple CHAOS functions. What if we use F[functionname] without the brackets? Would even be interested in an alias for FDRUNK to keep things clean. I don’t get it either - what is .R, what does 275 do, what 2.75 an what are the slashes for? Also does “next value” mean you basically define a more or less random sequence in the I script and then go through it with CHAOS without being able to alter any parameters. Like creating a still of the fancy diagram above at p=2.75? I have never looked into its details, but Gendy seems to be a popular source of uncertainty in music. I think it was originally imagined as an audio source, but was later adopted for control purposes. Here is a cpp source. Also CSound files. A major problem will be deciding which parameters to expose. it has the cool property that x oscillate between positive and negative. so if you do interpolation by cosine segment it’s a sine oscillator, &c.
with a<3.2 or so it’s period=2, with amplitude kind of dependent on a. orbits tend to get longer and denser approaching a=4, whereupon it blows up. Henon map is a fun 2-state recursive function that comes from celestial mechanics. with a in, like, [1-2], b in, say, [0-1]. this is denser and “crunchier” than cubic, and it’s fun to have different outputs for the different states. you can do a lot of fun things with coupled nonlinear force terms. here’s an oscillator based on th fermi-pasta-ulam-tsingou model. basically its a bunch of masses connected by springs, where the force term for the spring has a cubic term. you get differenet cool enharmonics by changing the “pickup position.” have found it very nice for LFO bank as well as audio rate. i’ve seen a version of the logistic map with two variables, referred to as ‘twisted logistic’… will update here if i can dig up the details. it’s very musical. 1-d, binary cellular are always fun and very simple to implement. with continuous states you get what i’ve seen referred to as cellular dynamata… which can really model a large range of dynamical systems… and there’s a deep rabbit hole. i gotta point out that gendy is stochastic. whole other can of worms. it is an implementation of the stochastic sieves xenakis used to produce waveforms for Metastasis (1955.) my opinion is that complex applications of random variables (gendy, markov chains) fall kinda outside the scope of a single TT operator. but it’s just an opinion. these all require a uniform random variable as a starting point. oh, BTW: can be hard to make even simple recursive functions behave properly with fixed-point arithmetic; rounding errors make it too noisy. i’d just use soft floats on AVR32 and eat the cycles. you probably realize this already. mary tsingou was a woman of greek ancestry working at Los Alamos in 1955. it’s shameful that her name has been omitted from this groundbreaking work for half a century. Interesting read! I’ll think about that one. R is the parameter to the hypothetical CHAOS operator. Slashes are just a comment describing what 275 meant. Cellular Automata might be worthy of an entire operator, but I could just as easily fold it into the chaotic generator. Am I right that CHAOS would most of the time give exactly one or two values, then suddenly a lot of random values depending on what was put in the I script? So that the above example with 275 would just always output about 65? If so I would include the parameter (here: 275) into the actual operator instead of having CHAOS.R 275 executed once in the I script. Probably I still don’t get it but I hardly see any use of it like that while CV 1 CHAOS.R X with X dynamically varying between 0 and 400 might be interesting as it will happen nothing or something drastic in a way that is more unpredictable the higher X is. It also should be scaled to meaningful range then. EDIT: Starting from 0 also does not make sense, does it? At high levels of R, the sequence produced by repeated calls to CHAOS will be chaotic. At low levels of R, the sequence is not chaotic. Isn’t the sequence at low levels of R not even a sequence?